What Man Needs A Light Gray Suit? The majority of men’s suits are made in dark colors. Darker suits are more formal, and often easier to match shirts and ties with. 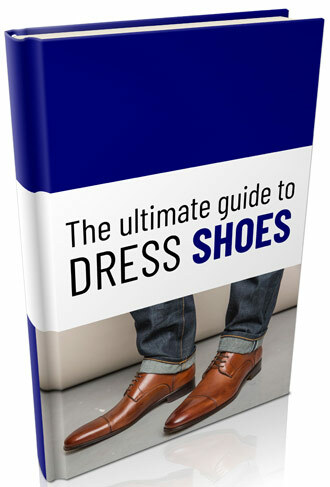 Most businesses that still require suits and ties every day specifically require dark suits, while the offices that once saw lighter suits in daily use have gone to slacks-and-shirtsleeves dress codes as standards relax. This leaves light suits as a predominantly casual wardrobe option — and a perennial favorite of sharp-dressed men who take advantage of the lighter shades’ rarities. Light gray is the most versatile of all the light colors, and holds a special place in the wardrobe of any sophisticated suit-wearers. The line between “light gray” and “medium gray” can be difficult to draw, but a good rule of thumb is that any shade a white pinstripe would stand out against is medium gray. At the point where white threads are disappearing into the overall color, the gray is true light gray. The thread should still be visible after a moment’s inspection or up close, of course — a true white suit is a completely different creature, and men have no business wearing anything that could be mistaken for one outside of a wedding or a disco. Light gray suits are casual wear. They do not belong in conservative offices that still adhere to strict business-dress standard. A man could wear one in a workplace that does not require suits and ties, but should understand the formal limitations of lighter colored suiting. In fact – versatility wise – he might be better served with a sport jacket and odd trousers at that point. A light gray suit is something to wear to dinner, out dancing, or just around the town on a day off. Light gray suits are rarely patterned. Patterning reduces the formality further, to the point that a sport jacket and odd trousers would make more sense than a matched suit of such aggressively informal design. When it is done, light gray suits are usually patterned with darker threads, typically in pinstripes or faint plaids and checks. These are borderline novelty garments, most commonly seen on entertainers and cultivated eccentrics. Light gray is a popular color in warmer climates, making lightweight wools and cotton a natural choice for light gray suits. “Tropical weight” wool may actually work better than cotton for a suit coat in humid climates — wool wicks moisture away from its wearer and resists saturation much better than cotton if it is not woven for the heat (seersucker is an example of cotton woven the right way for heat). Even lightweight wools still have a natural drape that also make them ideal for menswear, falling smoothly down the body without seeming too sculpted or too flowing. Summer and tropical suits are also often made of linen. This natural fiber is much lighter than wool, and tends to billow on its own. Dyed linen tends to have a very flat, matte appearance as compared to the more lustrous wool. Cotton is a distant third material, occasionally woven in lightweight twills to make affordable suits, but these tend to wear and stain easily, and lack the breathability and water resistance of wool or linen. 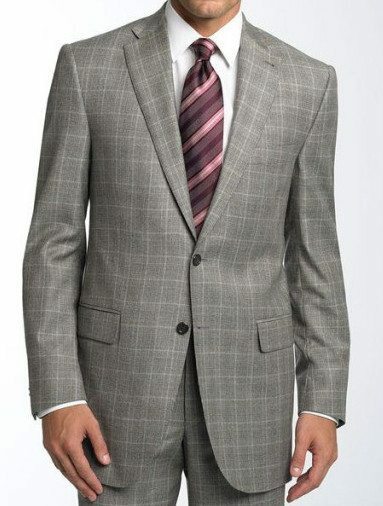 Again – seersucker is the best way to wear a cotton suit in light gray – but light grey seersucker suits are the realm of custom clothiers thanks to their demand by only men who truly understand their benefits. 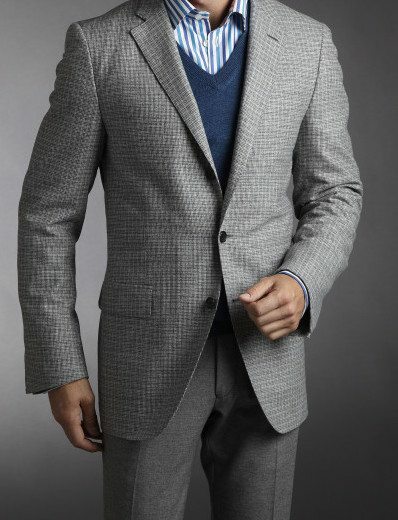 Heavier suits in light gray are rarer, and almost always wool flannel. Many are more casual versions of the “Man in the Gray Flannel Suit” business classic — dressed-down adaptations of traditional mid-20th century menswear. They tend to feature soft, napped wool and untapered “sack” jackets. Good quality wool flannel makes these extremely comfortable garments, excellent for prolonged wear on a weekend or evening out in the fall or a sunny winter day. Like any suit, light gray outfits should hang close to the body without billowing. The suit should never be tight enough to pinch or wrinkle at any point, but men want to avoid excess fabric that waves or flaps when their body moves. Lighter colors can be particularly susceptible to a “breezy” impression; a closer fit helps keep them looking trim and flattering. Light gray is strictly a single-breasted jacket color. The formality of a double-breasted suit jacket or three-piece suit would look silly in such a casual shade. Even a three-button or 3/2 style jacket may be pushing it — two buttons, low down on the body, are the best option for a light gray suit. The deep “V” shape and good expanse of shirtfront emphasizes the relaxed nature of the garment. A single-breasted, two-button jacket in a casual color like light gray can be worn without a necktie without looking incomplete, something of a rarity in matched suits. Like its darker cousins medium and charcoal gray, a light gray suit has no opposites on the color wheel. It is simply a shade of black. That doesn’t mean that nothing will clash — any color in a shade of similar lightness will look like a mismatch with light gray. No, what there needs to be is a clear distinction between how close the gray is to white and how close the colors worn with it are to the same point. Deep colors help make the contrast clear, as do patterns. Plain white shirts will usually be too close to light gray to be a good match, and should be broken up with a pattern of some kind, ideally in a dark color. A patterned gray suit is an ambitious sartorial challenge. Pinstripes in a dark color can be an interesting inversion of traditional business-wear (dark gray with light-colored pinstripes), but dress shirts then need to avoid clashing with both the light gray and the color of the stripe. Plaid in such a light color looks odd, and big windowpane checks on a light color is aggressively retro — one of those looks better left in the 1970s. Texture in the fabric can make a less jarring alternative to a pattern in a dark color and help emphasize that the suit is light gray rather than off-white. 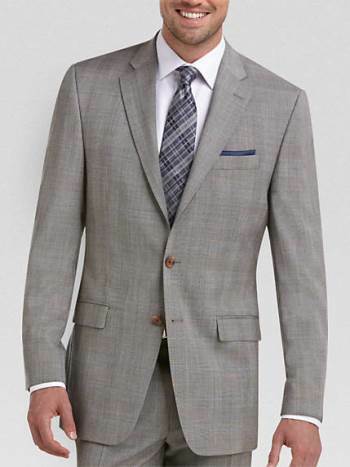 Light gray suits are ideal for men who wear suits by choice or have all of the foundation suits covered. Men who wear suits out of business necessity will want to opt for darker colors and more conservative choices; men who want to look sharp when they go out socially can wear light grays with confidence. The color will stand out as a consciously-thought choice rather than a default style. Men in hot, humid climates will also want to think about investing in a light gray suit – especially one that is unlined and made from a lightweight fabric. 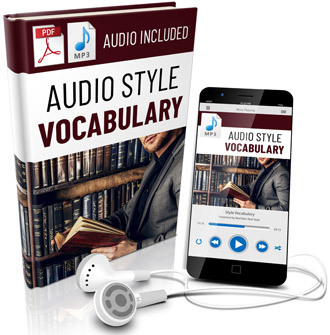 Dress codes in general tend to relax as the thermometer climbs, meaning that a light gray suit might be a more useful piece of business wear than it would be for a man in a temperate climate. And the color will certainly be more comfortable to wear on social occasions than most other options. At the end of the day, light gray isn’t a suit that every man needs — but it’s a color than nearly any man can look good in if he wants to. Adding a light gray suit to the closet gives you a powerful tool for social occasions and a unique chance to stand out in a crowd.